The vendor plans to show the new SDK for portals and other apps, as well as multiway videoconferencing technologies, at HIMSS16. 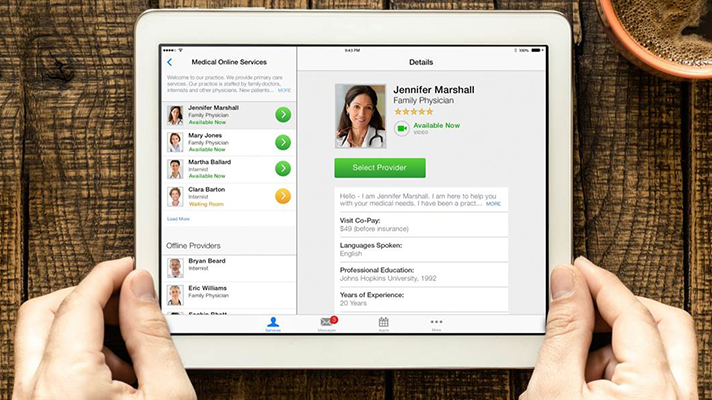 American Well will debut at HIMSS16 a software development kit for payers and providers and what it calls “Uber-like,” multiway videoconferencing technology. The new videoconferencing option can simultaneously connect patients with multiple physicians and specialists, and the SDK is designed to enable users to incorporate telemedicine consults into patient portals and other apps. Schoenberg cited as an example diabetes care. If a health system develops an app for diabetes patients that lets them access electronic health records data, care plans, and self-care features to assist with insulin administration and diet, the health system can use the SDK to bring into the app American Well technology for telemedicine consultations. “Then, if things start going the wrong way for a diabetes patient, the patient can fire up an on-demand, live telehealth consult with a provider – an endocrinologist, a nurse, a physician, another caregiver,” Schoenberg said. And the telemedicine consult is delivered not through an American Well branded experience, but through an experience branded by the health system, the brand that patients know and trust, he added. American Well also is debuting at HIMSS16 multiway video technology that enables providers meeting with patients for telehealth visits to bring in third and fourth parties such as physician specialists, translators and family members. “Providers aspire to collaborative care, but trying to schedule a patient with a multidisciplinary team becomes cost-prohibitive and the reality of trying to get multiple people together has been almost impossible,” Schoenberg said. The multiway telehealth visit technology lies on top of American Well’s telemedicine systems, which feature technology similar to that of the car-for-hire mobile app Uber, that serves as a switchboard, thereby enabling patients or physicians next to patients to quickly find and consult with pre-defined groups of physicians. American Well will be demonstrating the SDK and multiway communication tools in booth 2154.